Between 1000 B.C. and 1700, Central Ohio was the nexus of many groups of Native American cultures that today we call the Moundbuilders. The history of the Adena, Hopewell and Fort Ancient people is often overlooked, but there are still many sites around Columbus that offer a glimpse of these cultures. Here are six destinations where you can see earthworks and artifacts and get an idea of what life was like in the distant past. 1. Hopewell Culture National Historic Park- About an hour south of Columbus along the Scioto River in Chillicothe, this vast site was an ancient capital of the Hopewell people. The Mound City Group at the park is a 13-acre rectangular area enclosed by earthen walls 3-4 feet high. Inside are at least 23 conical burial and ceremonial mounds Archaeologists have found indication that a ceremonial road once connected the Newark and Chillicothe sites - arrow-straight, 200 feet wide and 60 miles long. Artifacts found at the site come from as far away as Yellowstone and the Gulf Coast, indicating that this was a nexus of a widespread culture. 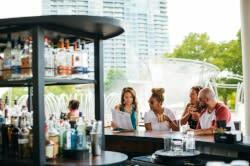 One-hour tours occur daily at 10 a.m. and are highly recommended as a great orientation to the culture. 2. 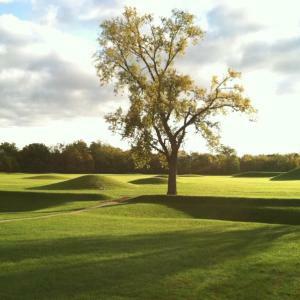 Newark Earthworks - The Newark Earthworks are made up of three sites, all about 45 minutes east of Columbus and are on track to be named a UNESCO World Heritage Site. The Hopewell people built these vast earthworks by moving dirt with baskets - which is incredible, considering the vastness of this site. The Octagon Earthwork consists of eight walls, each measuring 5-6 feet tall and 550 feet long, enclosing an area of 50 acres. The earthworks were a ceremonial center, a burial ground and a calendar - they are aligned with the solstices. 3. 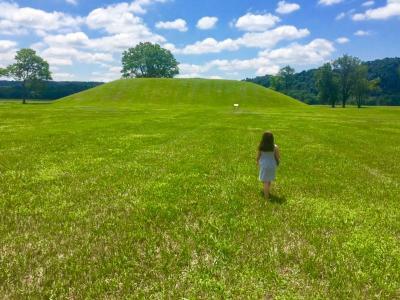 Seip Mound - A few miles away from the Mound City Group, this unstaffed National Park Service site includes an enormous burial mound that measures 30 feet high by 240 feet long by 160 feet wide. It covers two large burial structures where artifacts such as a clay face effigy and copper breastplates have been found. The site originally comprised two miles of earthwork walls, including a large square and two circular enclosures. 4. Shrum Mound - Located within the city limits of Columbus, this mound stands at 20 feet tall and 100 feet in diameter. Columbus was once scattered with hundreds of earthworks, but few remain - this is one of the best and easiest to access locally. Mound Street, in downtown Columbus, got its name from a prominent mound near the street&apos;s intersection with the High Street. Though the mound no longer stands, the clay from it was used to make the bricks that built many of Columbus&apos; first buildings. 5. Ohio History Center - This museum near the Ohio Expo Center, houses lots of artifacts from Ohio&apos;s past, but some of its most iconic pieces date from the Hopewell era, around 200 A.D. A copper face effigy, found at the Hopewell Culture National Historic Park and intricately carved effigy pipes are among the collection. 6. 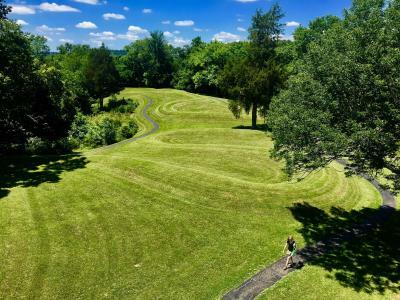 Serpent Mound - This awe-inspiring site is about an hour and 45 minutes away from Columbus, but worth the expedition. It&apos;s the largest effigy mound (mound shaped like an animal) in North America. No artifacts have been found at the site, leaving the question of which culture built it a mystery. A viewing platform near the tail of the 1/4 mile-long snake creates the perfect vista to take in the immensity of the earthwork.